Sometimes, during the course of looking for the next gun, there is a tendency to overlook the one that rides in a belt holster, the one that protects home and one that might best serve as a survival firearm. This is certainly the case with my 357 Magnum revolver. No, I am not suggesting that everyone needs a 357 Magnum. I am saying that, over the years, I always seem to have one that does more than just go to the range ot give me something to talk about with friends. For you the choice might be quite different. When I first purchased this Ruger GP100, my fourth or fifth, I cleaned it up in a way that suited my personal preferences. Trigger contact surfaces were cleaned up and polished in a proper hammer – sear fitting fixture. The mainspring rate was reduced without jeopardizing reliable ignition and precision shims were used to center the hammer and other floating trigger pieces. The result is a very smooth 6 lb 15 oz double action pull and a 3 lb 5 oz single action pull. The revolver is always shot double action. 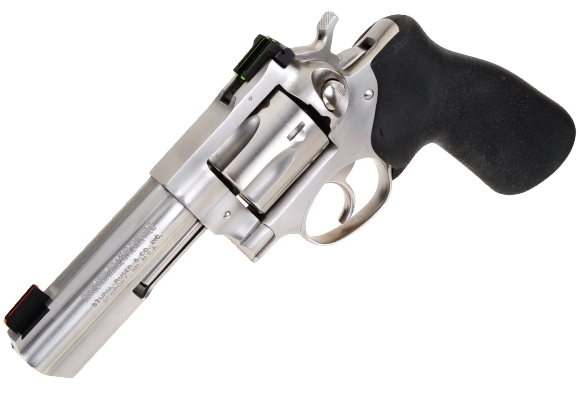 A soft Hogue grip replaced the factory piece and set the grip angle 11° back from perpendicular with the revolvers bore centerline. Adjustable fiber optic sights, red front and green rear, replaced the factory set. Cylinder gap, hammer dropped and trigger held back, is a snug 0.004″. The gun never sees 38 Special ammunition. I don’t like running short cases through the cylinder and it is too easy to reduce load 357 Magnum brass. The 357 S&W Magnum has been with us since 1935, wearing the title of the world’s most powerful handgun cartridge, convincingly, until 1955 when that title passed to the 44 Magnum. The 357 S&W Magnum has been chambered in double and single action revolvers, single shot and repeater rifles and a few specialized autoloading pistols. In the hands of skilled hunters, the 357 S&W Magnum has been used to take down feral hogs, deer and black bear in the hands of skilled handgun hunters. Larger game kills have been reported, but that is surely not a hunting application endorsement. The 357 S&W Magnum was also used by our military during the Korean war to penetrate enemy body armor. 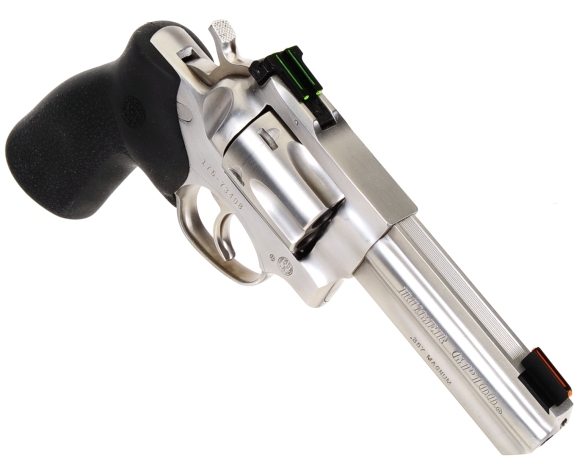 The Ruger GP 100 has stout cylinder walls, however, the cartridges compact 0.440″ rim allows for an easy to conceal 1.555″ cylinder width. Outside wall thickness is 0.086″ with cylinder indexing notches offset to maximize chamber wall thickness. Cylinder length is 1.618″ and, combined with clearance from the back of the cylinder to the revolver’s recoil shield, provides handloaders with a good deal of overall cartridge length latitude. SAAMI overall length specification is 1.590″, rear face of rim to end of seated projectile. The grip is 4.5″ down the backstrap and 2.5″ down the front for three finger support. In a high grip, the reach and angle to the trigger is comfortable making double action shooting relatively easy to master. Sights, both factory and the HiViz pictured are excellent for defensive and hunting applications. There are currently fifty one types of 357 S&W Magnum factory ammunition and sixty eight types of 38 Special ammunition that are compatible with this firearm. Again, I don’t shoot 38 Special ammunition in my 357 S&W Magnum firearms, so that will be the point of focus. Bullet weights for factory ammunition range from 50 grain fragmenting to 200 grain hard cast. Approximately fifteen loads from that population are good trail and hunting loads, five are specialty light bullet self defense loads, five are dedicated target shooting ammunition, and the remaining twenty six are for self defense with some trail/hunting load overlap. The ammunition appearing on the table below is a good cross section of mainstream factory ammunition. As the trend is for factories to change names and packaging of ammunition with great frequency to create the illusion of “New!”, I can’t swear any particular type will not be in stock or available at any point in time. The relative information is still very much valid as a statement toward the GP100’s propensity for accuracy. Groups were shot with the Ruger supported in front on a steel rest with shot filled bag and a shot filled bunny bag supporting the grip and my hand at the rear. Is that enough ammunition consumed to place the Ruger’s accuracy in context? Sure. I know the revolver well and any article using lots and lots of ammo as a criteria for statistical accuracy in determining a firearm’s performance is horse dung. Five or six shots out of a revolver establishes group potential. Flyers after than point are an indication of something moving. Machines are boringly predictable, humans not so much. The prior statement is not to be confused with proficiency shooting. To follow a certain type of discussion on social media and give it credence, you would have to accept the premise that all humans are born with the same degree of skill and competency in shooting a firearm and it is only firearms that vary in accuracy. That only holds true if you have never gone to an indoor or outdoor range and seen people burn through tons of range ammo and never damage a target. My favorite is to walk out for a hundred yard target check of a 22 caliber varmint rifle and find other bullet holes of different diameters on my target. Run away train! Run way train! Where is it going? I was putting up some 40 S&W data when I realized 357 S&W Magnum data had been misplaced and, when located, was deemed to be ancient. I could not figure how, for the life of me, a cartridge as common, popular and useful wasn’t represented outside of more casual reference in articles. So I decided I would round up, compile and present some current data. This Part 1 is a baseline and quantified handload data will follow. 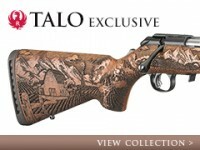 Eight bullet types and weights, between 110 grains and 190 grains, that cover a variety of applications were selected. Copious amounts of smokeless powder and primers will be consumed, serious damage will be done to paper targets and hopefully not chronographs. The results will be published, and you will be free to use or discard as suits you. Be back soon.